After settling in and recuperating from the overnight flight and drive to our hotel, we eventually made it out to scout Santa Margherita for dinner options. We came to the town with only one restaurant recommendation, Trattoria da Pino, which my sister had suggested to us from a past trip. We struggled to find it that first night and eventually gave up. Worn out, meandering around, we resorted to doing what so many travelers must do when they reach that pinnacle of restaurant-choosing frustration and desperation: find the nearest place. The nearest place looked OK at first, but we should have known it was a bad option when the menu came printed with English and German translations. Would any Italians eat here? But, we were tired and hungry, so we gave in. At least the children in the restaurant were happy. 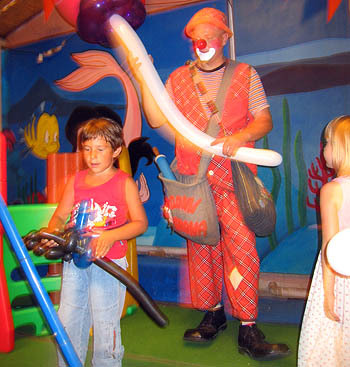 Very happy, in fact, because the restaurant had a real live clown on staff entertaining them in an outdoor romper room. They were better off, too. While we ate pasta with bland, leaden sauce, the clown wowed the kids by blowing up big, bright balloons. To add to the absurdity, the power went out twice during our dinner. And, at one point in the evening, when the staff tried to set up for the arrival of a party of eight, everything slowed to a standstill as four waiters completely ignored their tables and spent at least 15 minutes getting together plates, silverware, and a tablecloth. With the clown, the balloons, the bad food, the blackouts, and the confused staff, the evening reached a level of farce that actually made the meal somewhat entertaining. Needless to say, however, we didn’t return. Luckily, we found restaurant redemption the next day when we struck gold (or, in this case, insalata di mare) at our original culinary target, Trattoria da Pino. More on this to come . . .
Pairing Champagne, Cognac, and Cheese, tasting featuring Gosset Champagne, Frapin cognac, and artisanal cheeses, Wednesday, July 27, 6:30 p.m., at the Morrell Tasting Room, 729 7th Avenue, 15th floor. $85/person (212.688.9370). Beaujolais Tasting, learn about and sample "one of the most refreshing yet misunderstood wines in the world," Thursday, July 28, 6:00 to 8:30 p.m., at Crush Wine Co., 153 East 57th Street. Free (212.980.9463). Gin Weekend, taste gin and learn about its history and production, Saturday, July 30, noon to midnight, and Sunday, July 31, noon to 9:00 p.m., at LeNell's Ltd., 416 Van Brunt Street (between Coffey & Van Dyke). Free (718.360.0838). Summer Restaurant Week, three-course lunches for $20.12 and three-course dinners for $35.00 (beverage, tax and gratuity additional) on weekdays at participating New York restaurants. The promotion continues through September 5. We flew into Milan, rented a car and drove straight to our first destination, Santa Margherita. Located just east of Portofino, Santa Margherita is one of the most picturesque towns along the Golfo del Tigullio on the stretch of the Italian Riviera known as the Riviera di Levante. 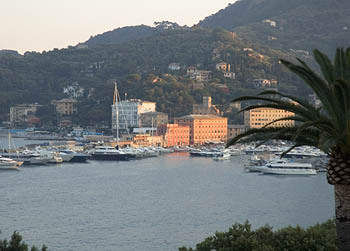 We had been to Liguria once before to stay in Camogli, a smaller, less-traveled village west of Portofino. Santa Margherita is bigger than Camogli, with more business and tourists, fancier shopping, and the constant zip and buzz of cars and scooters along the coast road (Camogli has only a pedestrian road along the water, so it is much quieter). For the next few weeks, The Food Section will open its passport once again for the fifth edition of Moveable Feast. Earlier installments of this ongoing feature have taken this site to Saigon, Montreal, Florence, and Washington, DC, for an immersion into food culture beyond New York City. This time, our destination is Italy for a gustatory tour in three acts: First, we head to the seaside resort town of Santa Margherita on the coast of Liguria. 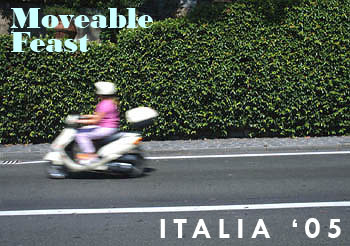 Next, we ride down the Autostrade to Grosseto in the Maremma region of Tuscany. 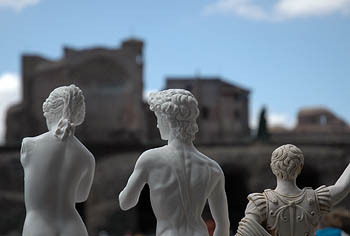 And, finally, it's on to Rome, where we conclude our visit and return to New York City. Italophiles, take note: This won't be a comprehensive account of everything one can, should, and must eat on a visit to these three places. With only two weeks in total (and, in particular, only three days in Rome), there is so much more to see and taste. Yet, with hundreds of photographs and some rapidly slipping memories, I hope to share some personal insights into the gastronomical encounters experienced on our Italia '05 travels. BLUR Above, a scooter speeds by on the coastal road linking Rapallo and Santa Margherita and continuing west to Portofino. Founded in 1936, Batch's Family Orchards in Washington's Lake Chelan Valley grows tree-ripened apples, pears, and cherries that are "picked at their peak" and shipped immediately to customers smart and organized enough to have placed a preorder for their amazing fruit (more on this later). Before we left for Italy, Greg Batch contacted me to send a sample of his Lapin cherries, which coveniently would be ripening just as we returned to New York. It was the first time I ever received cherries shipped to my door, and I was impressed that they arrived fresh, intact, and unbruised. 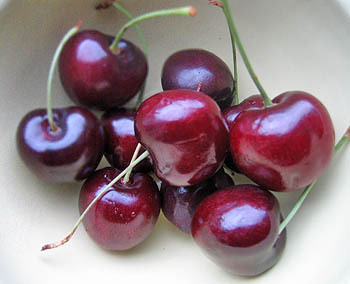 Lapin cherries (named for lapin, French for rabbit), are a variety of sweet cherries characterized by dark ruby skin, deep red flesh, and tremendous size. I don't think I've ever tasted cherries so large and so meaty. They are also super sweet, without a trace of sour flavor. Sinking your teeth into the big, crisp fruit is almost biting into tiny red plumbs, considering the amount of flesh that surrounds the pit. Batch's Family Orchards cherry crop spans 11 acres, including Sweetheart and Bing varieties along with the Lapins. The cherries are left on the tree until they are ripe, then hand picked and shipped either on the same day or the next. Bear in mind that these cherries aren't cheap (depending on the size of an order -- 3, 5, and 10 pound increments -- the cherries range in price from roughly $11 to $17 per pound), so think of them as a summer luxury. Because the cherries are sold only when they have achieved their maximum ripeness, Batch's Family Orchards depends upon preorders. Alas, at the time of this writing there are no cherries left for this season. However, preorders may be placed this fall for next July's harvest. Fall is also when Batch's will be shipping apples (Gala, Braeburn, Honey Crisp, Pink Lady, and Fuji), for which preorders will start in late August 2005. Batch's Family Orchards Lapin cherries, ranging from $49.95 for three pounds to $109.95 for ten pounds, are available for purchase through Chefshop.com (1.877.337.2491). 1. Tomorrow's Classics, Creating Your Own Cocktails, the Museum of the American Cocktail will present a seminar on the art of cocktail creation, Wednesday, July 20, 5:30 to 7:00 p.m., at Ruth's Chris Steak House, 148 West 51st Street. $35/person in advance, $40/person at the door (info@MuseumOfTheAmericanCocktail.org). 2. Porchetta Festival, roasted pig festival, Wednesday, July 20, 7:30 p.m., at Miss Williamsburg Restaurant, 206 Kent Ave., Brooklyn. Free (718.963.0802). 3. Fruit & Vegetables: What the Farmer Knows, Nina Planck, former director of NYC Greenmarket, will lead a discussion of the ins and outs of proper produce shopping, plus a wine, cheese, and tomato pairing, Wednesday, July 20, 6:30 to 8:00 p.m., at Murray's Cheese, 254 Bleecker Street. $50/person (212.243.3289, ext. 25). 4. Chefs & Champagne, annual food and wine event benefiting the James Beard Foundation will honor Michael Romano, executive chef/partner at Union Square Cafe, Saturday, July 23, 5:00 to 8:00 p.m., at WÃlffer Estate Vineyard, 139 Sagg Road, Sagaponack, Long Island. $200/person, $150/Foundation members (212.627.2308). 5. Blue Crab Festival, annual crab boil, Saturday, July 23, and Sunday, July 24, at The Minnow, 442 Ninth Street (at Seventh Avenue), Park Slope, Brooklyn. $30/person (718.832.5500). On July 7, when I was still happily ensconced in Rome, this blog turned two! 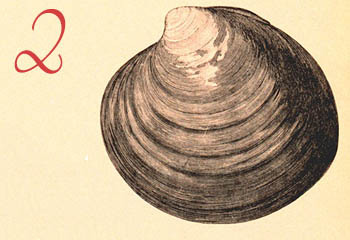 For the bivalve-challenged, the clam illustration above is meant to evoke the theme of this site's inaugural post on July 7, 2003, and one-year anniversary in 2004. Not to get too sentimental here, but creating this site has been an amazing experience. 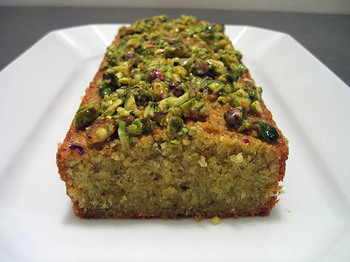 Not only has it provided an incredible outlet for my interest in all things food-related, from cooking to dining to food history and ephemera, but it's also been a way to connect with people with shared interests whom I never would have imagined interacting with before starting this site. It's something I could not have imagined in any way when I created the site two years ago. My thanks to everyone who reads this site. Thank you so much for your interest and support, and if you ever have any feedback, ideas, or comments, please contact me. Goodbye Italy. Hello New York. As we slowly adjust to our return home -- the temperature (muggy), the time (six hours behind), and the work (too much too soon), there are certain tastes, images, and sensations that still remain at the front of my head and the tip of my tongue. Before they slip away permanently, I've put a few down. Caffe espresso for under one euro. 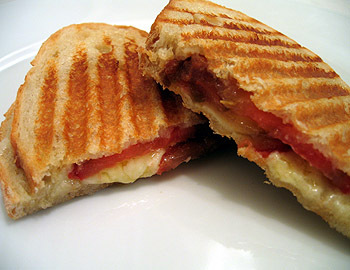 Roadside panini at the Autogrill. Pitchers of steamed milk served with coffee at breakfast. Wide fields of sunflowers in the Maremma. Floating with barely any effort in the salty water off of Santa Margherita. Easy access to caffe shakerato. Quartinos of house wine for only two euros. The recorded "arrivederci" called out from speakers at the autostrade toll booths. Endless varieties of acqua minerale gassata. Warm, fresh, and tender insalata di mare. Over the next few weeks, expect an onslaught of photos and tales from our visit. Regular posting will resume on Monday.